NASCAR is the rule, not the exception when it comes to enforcing anthem policy. When it comes to President Donald Trump's patriotic playbook, NASCAR is exemplary and the NFL needs a timeout. In a Tuesday tweet, the president urged NFL owners to create a doctrine to curb activist athletes who take a knee or sit down or stay inside the locker room during the performance of "The Star-Spangled Banner." But Trump might be surprised to learn that NASCAR lacks a national anthem rule. In fact, ABC News has taken inventory of some of the most popular professional sports leagues and NASCAR is the rule, not the exception when it comes to enforcing a documented national anthem policy. Only the NBA and the WNBA have evidence of a national anthem policy in their rule books. That means the governing bodies at highest level of competition in football, baseball, hockey and soccer leave the national anthem duties up to the individual athlete or team. The silent protests leaped beyond the football gridiron and onto the basketball court. 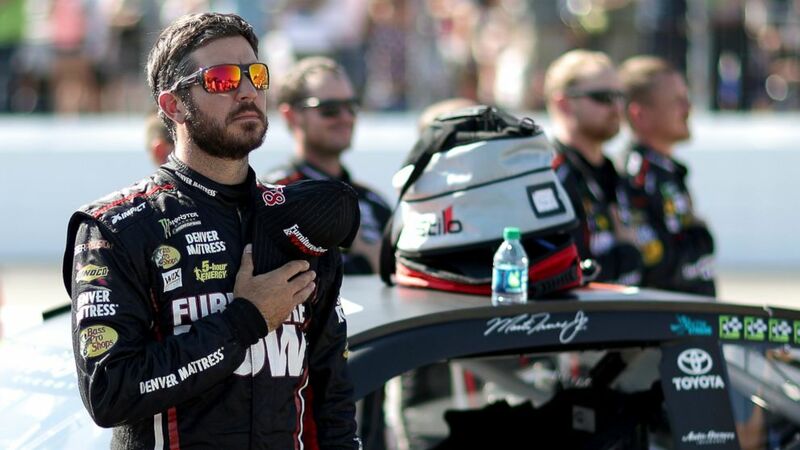 (Chris Graythen/Getty Images) Martin Truex Jr.stands during the national anthem prior to the Monster Energy NASCAR Cup Series ISM Connect 300 at New Hampshire Motor Speedway, Sept. 24, 2017, in Loudon, New Hampshire. For decades, athletes have traditionally lined-up before a game or match to observe the official national anthem "The Star-Spangled Banner," yet most professional sports leagues don't have a national anthem policy on the books. To ring in the third week of its season, hundreds of NFL players, coaches, and even owners struck a unified front by kneeling, locking arms together to skipping the anthem entirely as a countermeasure against President Donald Trump's singing rhetoric. On Friday, during a rally to stump for the now defeated Alabama senatorial GOP candidate Luther Strange, he called for the sacking of any player who silently protests when the national anthem is performed. "Wouldn’t you love to see one of the NFL owners, when somebody disrespects our flag, to say 'Get that son of a b---- off the field right now'?" he said in Huntsville, Alabama, before booming, "He's fired, he's fired!" On Tuesday, the president kept his NFL row going while appearing at a Tuesday press conference with Spanish PM Mariano Rajoyhas. He claimed he was "ashamed" by the players who had been taking a knee or sitting down during "The Star-Spangled Banner". "It’s called respect for our country," he said. On Twitter, the president poured on the schadenfreude by trying to prove his efforts were working because the NFL was experiencing a dip in its television ratings. Then, after America's team the Dallas Cowboys faced off against the Arizona Cardinals on Monday night, players and owner Jerry Jones linked arms and knelt before "The Star-Spangled Banner." Trump took note of the booing and "great anger" as some players knelt, then seemed to approve the players who stood. "Big progress being made." As October arrives, the WNBA playoffs will conclude, the Major League Baseball playoffs start and both professional hockey and basketball season will also get underway. 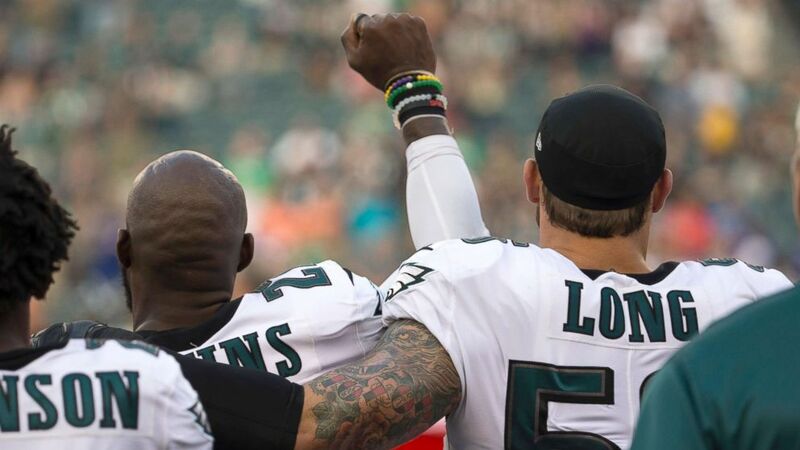 (Mitchell Leff/Getty Images) Malcolm Jenkins #27 of the Philadelphia Eagles holds his fist in the air during the national anthem while Chris Long #56 of the Philadelphia Eagles puts his arm around him prior to the preseason game against the Buffalo Bills at Lincoln Financial Field, Aug. 17, 2017 in Philadelphia. Lyrics of the "The Star-Spangled Banner" -- which was previously titled "The Defense of Fort M'Henry" -- were written by Francis Scott Key in 1864 aboard a British ship in Baltimore, Maryland. The original sheet music included a typo, misspelling "patriotic" as "pariotic." Key's lyrics were set to a melody from an Old English drinking song called, "To Anacreon in Heav'n." In 1916, President Woodrow Wilson signed an Executive Order to make "The Star-Spangled Banner" be played at military ceremonies. The song earned a rapturous response when a military band back in 1918 when the Chicago Cubs faced the Boston Red Sox in the World Series. These were days when players themselves were conscripted. Then by 1931, President Herbert Hoover signed a bill making the song the official national anthem. Adhering to certain conduct during a national anthem performance is actually written into the U.S. Code. According to the Code, the U.S. flag must be displayed during the national anthem, and when the first note is played, veterans and members of the armed services -- whether in uniform or not -- "are expected to give the military salute" until the last note. (Jason O. Watson/Getty Images) Bruce Maxwell #13 of the Oakland Athletics kneels during the national anthem in front of teammate Mark Canha #20 before the game against the Seattle Mariners at the Oakland Coliseum, Sept. 25, 2017 in Oakland, California. The president may wish NFL owners could create rules to squash national anthem protests, but it would call for the NFL to actually make its loose rules official. According to the 2017 NFL Rule Handbook, there is no mention of decorum protocols during the national anthem. The only mention of conduct during pregame is Article 8, where "personal messages" are "prohibited." The rule states: "...players are prohibited from wearing, displaying, or otherwise conveying personal messages either in writing or illustration unless such message has been approved in advance by the League office." Otherwise, the league relies on a language outside its rule book that ABC News was sent. In it, the league could sanction any disobeying football player, these rules operate more like suggestions. Prior to every NFL game, "The National Anthem must be played," according to the NFL's rules. Not only must "all players" be present on the sideline for the National Anthem, but the NFL rules state, "players on the field and bench area should stand at attention, face the flag, hold helmets in their left hand, and refrain from talking." Moreover, the NFL asks that the "home team should ensure that the American flag is in good condition" and that it's "pointed out to players and coaches that we continue to be judged by the public in this area of respect for the flag and our country." The league has some measures in place for anybody who shirks being on the field "by the start of the National Anthem" the NFL rules state. Such measures "may result in discipline, such as fines, suspensions, and/or the forfeiture of draft choice(s) for violations of the above, including first offenses." Despite this hardlined language, no players will be fined for their demonstrations from Sunday and Monday's games. 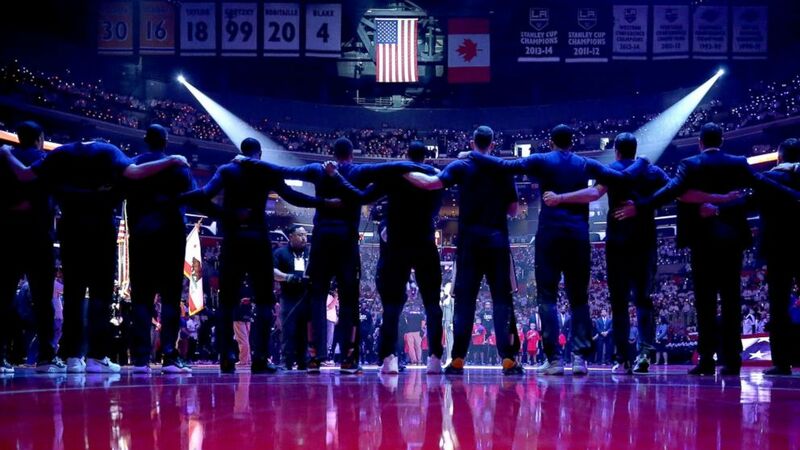 (Sean M. Haffey/Getty Images) The Utah Jazz stand together during the national anthem prior to Game Seven of the Western Conference Quarterfinals against the Los Angeles Clippers at the Staples Center, April 30, 2017, in Los Angeles. NASCAR was thrust into pole position of this controversy after the president showered praise for hits drivers and fans who stood and honored the Stars and Stripes during their national anthem. Richard Childress, formerly Dale Earnhardt's car owner, according to The Associated Press, made comments threatening to send anybody packing who would try to commit a silent protest during the "Star-Spangled Banner" performance. "It’ll get you a ride on a Greyhound bus," Childress told The AP. Childress warned "anybody that works for me should respect the country we live in. So many people gave their lives for it. This is America." Then Hall of Fame driver Richard Petty said he would fire any staffer who protested the anthem and then called for deportations. "Anybody that don't stand up for the anthem oughta be out of the country. Period. What got 'em where they're at? The United States," he said. Notably, NASCAR confirmed there is no such policy in place and no plans to formalize one for its drivers when it comes to the national anthem played at races. On Tuesday night, the 2016 champion Los Angeles Sparks were a no-show during the national anthem performance. The Sparks remained in their locker room as "The Star-Spangled Banner" performed, while their opponent, the Minnesota Lynx, locked arms to show solidarity against racial injustice. The move came on the heels of almost every NFL team staging some form of solemn protest during their respective pregame national anthem ceremonies. Only the NBA and the WNBA contains formal national anthem engagement rules in their 2017 rulebooks. The rule is found in the section under Player and Team Conduct and Dress Section which states: “Players, coaches and trainers are to stand and line up in a dignified posture along the sidelines or on the foul line during the playing of the National Anthem." The NBA has the exact same policy that is outlined in their rule book. The emphasis on “dignified posture,” as well as “standing,” are identical in each league. The rule had precedent when back in the 1995-1996 season a player named Mahmoud Abdul-Rauf decided to forgo the anthem and remain in the locker room during the national anthem. His decision led to a one-game suspension and ultimately the league and Rauf compromised: when the anthem was performed Rauf would stand but was allowed to pray with his eyes closed. Despite the display by the Lynx and decision to huddle in the locker room, ABC News has learned both teams worked with the league well in advance to dialogue about their the decisions, and it's unlikely any punitive action will be taken. 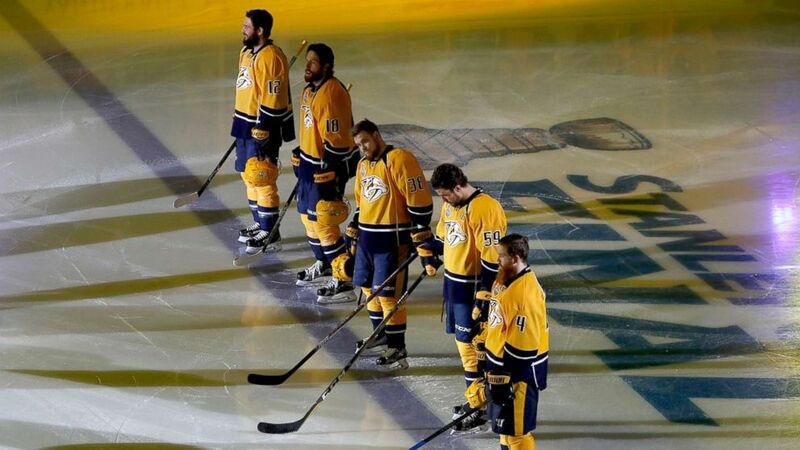 (Justin K. Aller/Getty Images) Nashville Predators players stand on the ice during the national anthem prior to Game Three of the 2017 NHL Stanley Cup Final against the Pittsburgh Penguins at the Bridgestone Arena, June 3, 2017, in Nashville. The U.S. Soccer Federation policy manual includes: "New Policy 604-1—Anthem." It's a rule that requires players to "stand respectfully during the playing of the national anthems at any event in which the Federation is represented." Meanwhile, Major League Soccer, or MLS, doesn't have such a policy. Ever since the first game in 1996, officials and children file into the stadium singing the anthem as a pre-match tradition. But the league has not made it a priority to put a national anthem policy in place. In an official statement sent to ABC News, players are encouraged "to stand during the national anthem" they are not required to. The official added, "We respect and support their right to express their personal beliefs." For the MLS, the statement went on, the "Star-Spangled Banner" tradition "provides our clubs and fans an important and time-honored opportunity to salute our country and stand up for its principles -- whether in the United States or in Canada. "At the same time, freedom of speech -- and the right to peaceful protest -- are the hallmarks of both countries." Hockey's upcoming season will begin in October and it will commence without a formal national anthem policy. When asked about the NHL's stance when it comes to the National Anthem, spokesman Gary Bettman would only suggest that the anthem and the players decisions "are a matter of individual belief and individual choice." "In the final analysis, people are going to have to decide what makes them comfortable." 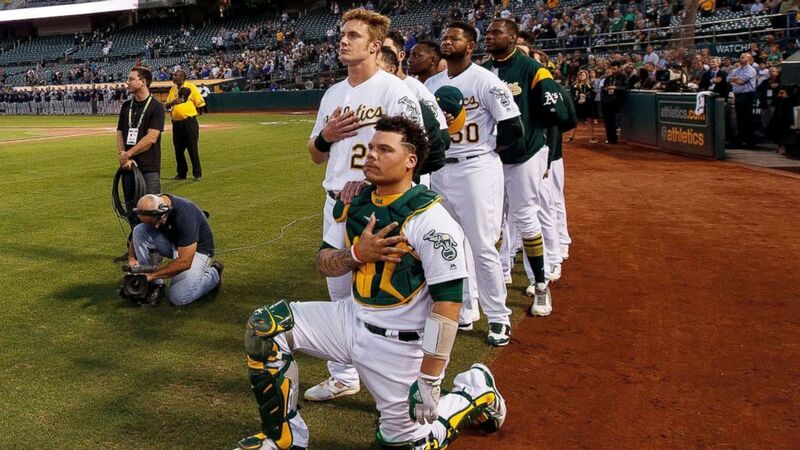 On Saturday, 26-year-old Oakland Athletics catcher Bruce Maxwell kneeled during the national anthem before the team faced off against the Texas Rangers. It made him the first major league baseball player to engage in peaceful protest. "Everybody watches sports and so everybody loves sports, so I felt this was the right thing for me to do personally," the rookie said. Before a home game against the Texas Rangers, Maxwell dropped to a knee just outside Oakland's dugout, adopting a protest started by former San Francisco 49ers quarterback Colin Kaepernick in response to police treatment of blacks. When reached by ABC News an MLB spokesman didn't explain why the league does or doesn't have a policy, only saying that the anthem is a valuable ceremony and welcomes players' personal expression. Not every competition in pro golf incorporates the national anthem. When it does, there are no definitive measures to force players stand at attention or participate. "The PGA TOUR does not have a policy in place regarding the National Anthem in its Player Regulations Handbook," a tour spokesman said in a statement. "Due to the structure of the PGA TOUR week-to-week, the National Anthem is not played prior to competition outside of tournament-related ceremonies that do not typically involve PGA TOUR members." Tennis is another international game and varies its national anthem ceremonies. The USTA confirmed to ABC News that they have "no policy in place and no plan to implement one at this time." Likewise, the ATP World Tour, which involves 64 tournaments in 31 countries "no policy or requirement in terms of any national anthems being played at our tournaments."